Chapter 3- Guided Reading! - AP Environmental Science! • System: a set of connected things or parts forming a complex whole, in particular. • Open System: a system in which the components and protocols conform to standards independent of a particular supplier. • Closed System: The term closed system has different meanings in different contexts. • Materially Closed System: Which no matter moves in and out of the system. • Static System versus Dynamic System A dynamic system is a system that is constantly changing, like the human body system. A static system is a system in where there is no change, like the solar system. • Steady-State System: Some metabolic patterns are self-perpetuating. environmental questions? Is the establishment of a balance of nature ever possible? The concept is a somewhat antiquated attempt to ecologically model the steady state or equilibrium of natural systems. Nevertheless, most people subscribe to the idea that there is some basic state of ecosystems that we can determine and which will continue into the indefinite future if human disturbance is not excessive. Why is the concept of the ecosystem so important in the study of environmental science? we worry or not worry? The ecosystem is one of the most important system on earth because if we lose this from everyone then we will not have a earth. Earth will be just a place where there is no life because all the animals are gone and then we cant eat any meat. We will have to be herbivores and just eat plants all day. The average residence time is a measure of the time it takes for the total stock or supply of the material to be cycled through a system. Define: Flow: move along or out steadily and continuously in a current or stream. Flux: the action or process of flowing or flowing out. • Lag Time: The delay between a cause and the appearance of its effect. • Doubling Time: Time necessary for the quantity being measured to double. 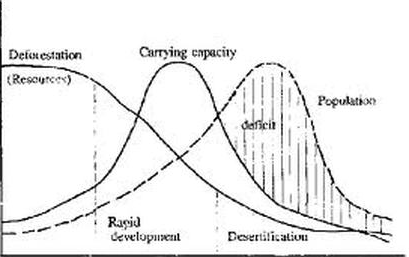 • Overshoot and Collapse (draw and label the graph) The carrying capacity, the decrease. Why does overshoot occur, and what could be done to anticipate and avoid it? Overshoot occur because its based on an assumption of hard limits to resources. By improving global environmental governance, and our ability to manage the Earth's resource is thus a key part of any solution. Discuss the idea of Environmental Unity. The idea of it being impossible to change only one thing since everything affects everything else. The idea is the geological and biological processes that occurs today are the same kinds of processes that occurred in the past and vice verse. The hypothesis states that life manipulates the environment for the maintenance of life.